NOTE: If meeting any of the requirements for this merit badge is against the Scout's religious convictions, the requirement does not have to be done if the Scout's parents and the proper religious advisors state in writing that to do so would be against religious convictions. The Scout's parents must also accept full responsibility for anything that might happen because of this exemption. The youth risk factors that affect cardiovascular health in adulthood. Have a dental examination . Get a statement saying that your teeth have been checked and cared for. Tell how to care for your teeth. Reasons for being fit in all components. What it means to be mentally healthy. What it means to be physically healthy and fit. What it means to be socially healthy. Discuss your activity in the areas of healthy social fitness. What you can do to prevent social, emotional, or mental problems. Are you free from all curable diseases? Are you living in such a way that your risk of preventable diseases is minimized? Are you immunized and vaccinated according to the advice of your health-care provider? Do you understand the meaning of a nutritious diet and know why it is important for you? Does your diet include foods from all food groups? Are your body weight and composition what you would like them to be, and do you know how to modify them safely through exercise, diet, and lifestyle? Do you carry out daily activities without noticeable effort? Do you have extra energy for other activities? Are you free from habits relating to poor nutrition and the use of alcohol, tobacco, drugs, and other practices that could be harmful to your health? Do you participate in a regular exercise program or recreational activities? Do you sleep well at night and wake up feeling ready to start the new day? Are you actively involved in the religious organization of your choice, and do you participate in its youth activities? Do you spend quality time with your family and friends in social and recreational activities? Do you support family activities and efforts to maintain a good home life? Before doing requirements 7 and 8, complete the aerobic fitness, flexibility, and muscular strength tests, along with the body composition evaluation as described in the Personal Fitness merit badge pamphlet. Record your results and identify those areas where you feel you need to improve. Find out about three career opportunities in personal fitness. Pick one and find out the education, training, and experience required for this profession. Discuss what you learned with your counselor, and explain why this profession might interest you. 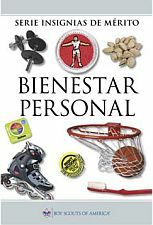 The requirements for the Flexibility, Aerobic Fitness, and Strength tests and for the Body Composition Evaluation which involves a calculation of the BMI percentile, which are all specified in requirements 6 and 8, are defined in the current Personal Fitness merit badge pamphlet. However, The Boy Scout Requirements booklet has different wording (unchanged from earlier requirements) for requirements 6 and 8 than what appears in the merit badge pamphlet. The text for requirements 6 and 8, above, is as the requirements appear in the Personal Fitness merit badge pamphlet. 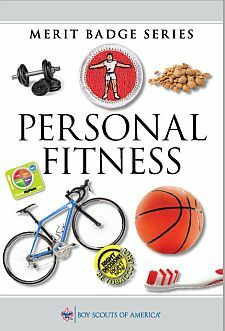 Before doing requirements 7 and 8, complete the aerobic fitness, flexibility, muscular strength, and body composition tests as described in the Personal Fitness merit badge pamphlet. Record your results and identify those areas where you feel you need to improve. Complete the physical fitness program you outlined in requirement 7. Keep a log of your fitness program activity (how long you exercised; how far you ran, swam, or biked; how many exercise repetitions you completed; your exercise heart rate; etc.). Repeat the aerobic fitness, muscular strength, and flexibility tests every two weeks and record your results. After the 12th week, repeat the three tests, record your results, and show improvement in each one. For the body composition test, compare and analyze your preprogram and postprogram body composition measurements. Discuss the meaning and benefit of your experience, and describe your long-term plans regarding your personal fitness. Sit-ups. Record the number of sit-ups done correctly in 60 seconds. 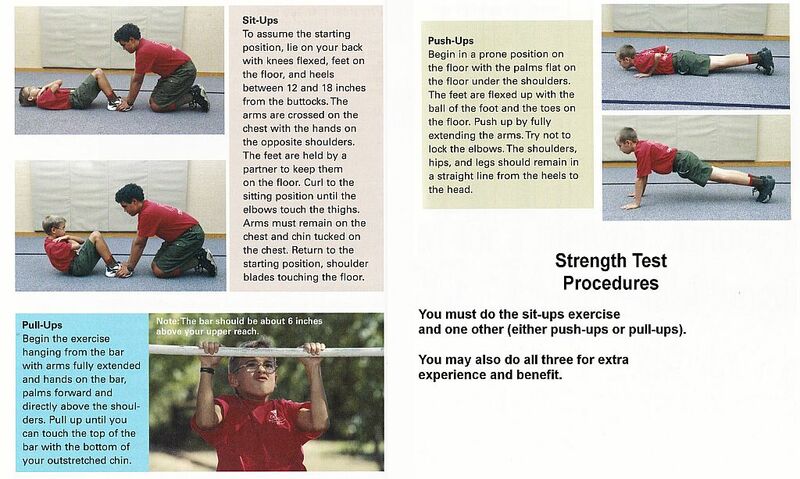 The sit-ups must be done in the form explained and illustrated in the merit badge pamphlet. Pull-ups. Record the total number of pull-ups completed correctly in 60 seconds. Be consistent with the procedures presented in the merit badge pamphlet. Push-ups. Record the total number of push-ups completed correctly in 60 seconds. Be consistent with the procedures presented in the merit badge pamphlet. Click here to see the test procedures presented in the merit badge pamphlet. To see instructions for building the Sit and Reach Box, Click here. The illustration shows dimensions for constructing the reach box in inches, while the requirement table in the pamphlet stipulates measuring the Scout's reach in centimeters (cm). Either attach a tape measure calibrated in both inches and cm to the top panel, or mark the top panel in cm. The measuring scale should extend from 0 at the front edge of top panel to 53 cm at a point 0.34 cm before the back edge. That should place the 23 cm point 0.14 cm behind the face of the foot panel. 1344 / 68 = 20. This means your BMI is 20. From the chart in the pamphlet, you are at the 50th percentile.